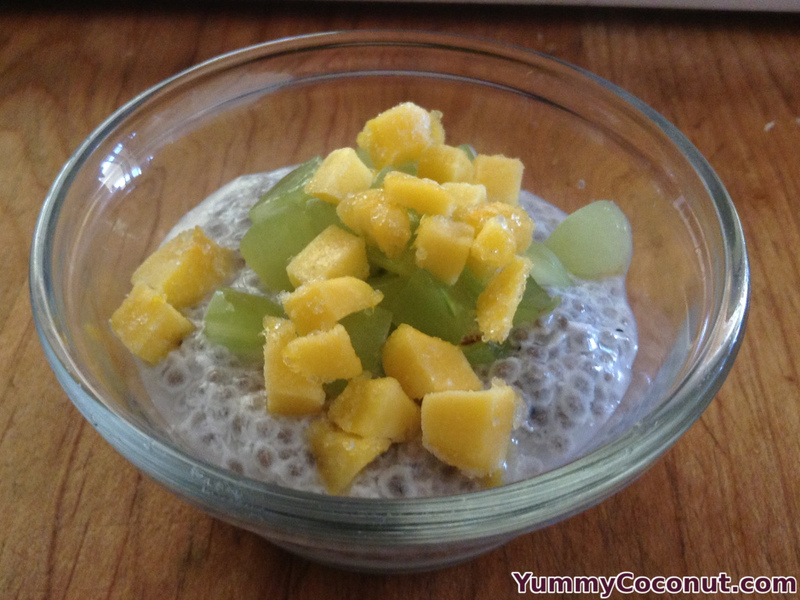 Mix together the shredded coconut, coconut milk, honey and chia seeds in a large bowl. Stir until combined. Transfer to a covered container and place into the refrigerator until the chia seeds have absorbed the liquid. This will take around 4-6 hours. Once the seeds have plumped, remove the container from the refrigerator. Mix in the mango and grapes and serve. Combine all ingredients, except fruit, in a large container. Mix all ingredients well and cover the container. Refrigerate the pudding overnight, or until the chia seeds have absorbed all the liquid (around six hours). Mix in the fruit just before serving and enjoy! Use any fresh or frozen fruit that sounds good to you. The coconut milk is so light in flavor it can pair with just about any fruit that you enjoy. The honey can be substituted for agave if you prefer. Depending on how sweet you like your pudding, add anywhere between 1-3 tablespoons of sweetener. You can taste test after the seeds have plumped to get it just right for you.